Back in September, when young Jewish composer and lyricist Benj Pasek was touring Seattle with his show A Christmas Story, The Musical! —which comes to Chicago in December—he attended Yom Kippur services. After all, said Pasek, he always goes to synagogue on Yom Kippur-and his mom would have been furious if he hadn't. Then, after shul, Pasek wrote Christmas jingles for the show. His two Yom Kippur activities seem paradoxical, yet Pasek joins a long history of Jews writing Christmas music. There's Irving Berlin's '"White Christmas;" Mel Torme's "Chestnuts Roasting on an Open Fire;" and Jerry Herman's "We Need a Little Christmas." Apparently, we Jews do need a little Christmas too. There's something anthropological about looking in at Christmas from the outside, according to Pasek. "We have a longstanding tradition of Jews who wrote Christmas songs," said Pasek, who lives in New York. "There is something about looking in on a culture in a way that being Jewish on Christmas allows you to do. You observe what people love about it." 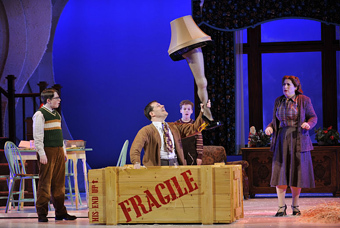 A Christmas Story, The Musical!, a new musical based on the holiday movie classic, plays the Chicago Theatre just in time for the holidays—Chanukah and that other little December holiday you may have heard of—from Wednesday, Dec. 14 to Friday, Dec. 30. I watch the film version of the A Christmas Story on a continual loop on cable every Christmas as many of you probably do-after all, what else is there for a Jew to do on Christmas before going out for Chinese food? Chinese For Christmas. Photo credit: Kansas City Repertory Theatre. The 1983 film comedy—and now the musical—are based on the writings of radio humorist Jean Shephard. The plot centers around young, bespectacled Ralphie Parker's Rockwellian existence in 1940s Indiana as he schemes his way toward his ideal holiday gift-a Red Ryder Action Air Rifle BB Gun. Yet, the adults in his life burst his bubble with repeated warnings that "You'll shoot your eye out." Peter Billingsley, who starred as Ralphie in the film, is among the producers of the new musical, while Joseph Robinette wrote the script, John Rando directs, and Warren Carlyle choreographs the show. Pasek talks about the process of adapting a film into a musical. "Usually, in musicals, the biggest emotional high points are the ones you want to sing," said Pasek, who is half of a composer/lyricst team with his friend and fellow 2007 University of Michigan grad, Justin Paul. "It's expanding the little moments from the movie and making them bigger and broader." Fans of the movie will be happy to watch beloved elements of the film come alive in the stage version of the story including: a department store Santa, played by Jewish Chicago actor Adam Pelty; a double-dog-dare to lick a freezing flagpole; a dancing leg lamp with backup leg lamp dancers; and some very obnoxious pink bunny PJs Ralphie was forced to wear in childhood. Old man with leg lamp. Photo credit: Kansas City Repertory Theatre. Pasek's real-life childhood was very Jewish. He was raised in what he calls a "Conservative Reconstructionist" Jewish Philadelphia home, where his family kept kosher and he attended Hebrew school. 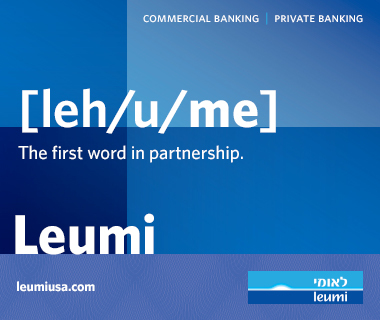 When he moved to Manhattan, one of his first jobs was teaching Hebrew school. Eventually, he made his way into the theater business—and has found success at it too. He and Paul were named the youngest winners of the Jonathan Larson Award and listed as part of the "50 to Watch" up-and-coming writers by The Dramatist Magazine. 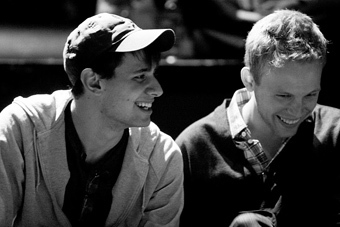 Now, preparing for the new musical, Pasek says Jews will enjoy the show as much as non-Jews. 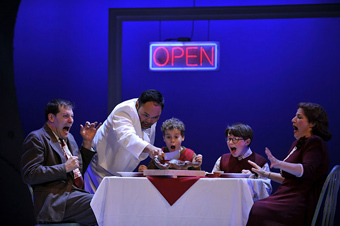 "A Christmas Story transcends religion in a way that it's just part of American popular culture," he said. "…It's not just a Christian thing—it's the same way my family bickers about Chanukah. It feels very universal." For ticket information, visit The Chicago Theatre box office, visit www.thechicagotheatre.com, or call 1 (800) 745-3000.